On the fence about getting permits? In the state of Florida, it is required to go through a simple approval process when installing and re-building wooden fences. Miami-Dade County, in particular, requires a permit to be submitted along with a detail drawing that denotes the dimensions, materiality, and type of concrete foundation that will be provided for the fence. Once the detailed is approved, all of the foundation holes must be dug into the ground and inspected by a city inspector. 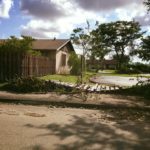 This process is crucial to ensure that the wooden fence can withstand the violent wind gusts that are synonymous with hurricanes. I have personally inspected hundreds of illegally installed wooden fences, and there is always an underwhelming method of installation. 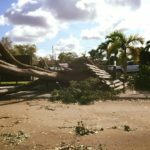 This is why so many wooden fence have been laid victim when hurricanes strike our state. Our firm has encountered numerous violation cases that pertain to illegal wooden fences, and the cost of the violation far outweighs the cost of permitting the fence from the beginning. Furthermore, as I have mentioned so many times before, one is only guaranteed proper installation when the construction is inspected by a city building inspector.